Rising through the ranks of the crowded and male-dominated world of finance and technology, financial services firm Practifi’s COO Emily Wilcox recently spoke with Eric Dye on EPN–the Enterprise Podcast Network—about her emerging role within the field, how fintech is developing and what the future holds for CRMs and women in the financial services sector. Speaking from her new-found home in Chicago, Emily started off by detailing her experience with Practifi, and what it was that led her to a career in the fintech space. Having been with Practifi for just over five years, Emily recalled how she was one of the very first employees in the team. Her journey with Practifi begins only a few short years ago. And her story is, like many young graduates’ stories, one which grows from the all-too-common tale of the new graduate, daring to take their first steps in the larger world, but without the confidence that their newly-acquired graduate degree should be instilling in them. “I was at university doing a law degree, and as many law graduates would know, at the point that you graduate you have a crisis and realise that maybe being a lawyer is not the game for you,” she reflected. “I was extremely fortunate to know both Glenn and Adrian, our co-founders, at the time, and they gave me the opportunity to come in and join the team at Practifi, a fledgling team at that point, as one of the foundational members of the team. To hear the interview in full, visit www.epodcastnetwork.com. To find out more about Practifi, visit www.practifi.com. About Practifi: Practifi ensures financial advice firms can realise their full growth potential while revolutionising financial services technology the world over. As a cloud-based business management platform, Practifi manages clients, partners, providers and centres-of-influence through a clean, intuitive interface. It’s the new benchmark for CRM-based systems in financial advice. 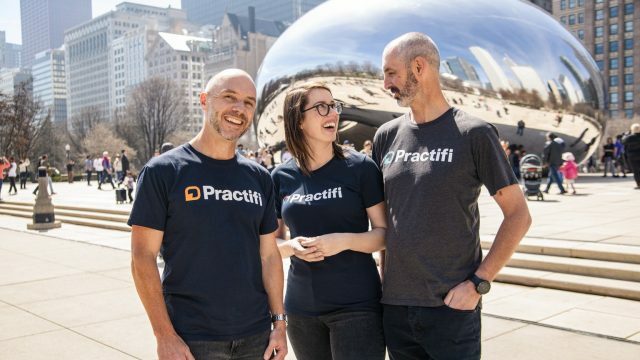 With offices in Sydney and Chicago, and loyal clients across APAC, Europe and North America, Practifi is passionate about partnering with advisors, providing the tools required to lead the financial advisory firm of the future.